I’m a sucker for slippers, especially now that the weather has turned cold. And so are my daughters. When these Nuknuuk Joy Slippers arrived at the Shoeaholics HQ, my daughters were fighting over who got to wear them first. I’ve always loved slip-on shoes and slippers with soles for busy mornings when I’ve had to run the kids to school. My kids are grown now, but with Mallory’s epilepsy seizures, I drive her to and from work. 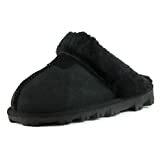 Now that winter is upon us, I love WARM slip-on shoes/slippers! Made of sheepskin, these Nuknuuk slippers are super warm. They are snug on the feet, which I like so you don’t have to “scrunch” your toes to keep them on, like with flip-flops. But they were not too tight across the vamp which is also good. Time will tell if they stretch out or not. I do hope the sole breaks in a bit as they are a tad rigid and stiff. These slippers pair quite well with my favorite VS pajamas, don’t you agree? I think they run a bit small as I received a size 8 (I normally wear a 7.5), and these are none too big. In fact, my heel hangs out the back further than I like. Luckily for Mallory, my only daughter with smaller feet than me, she may get to claim ownership of them. Nuknuuk slippers are available from nuknuuk.com. Have some shoes you want us to review? Contact us.